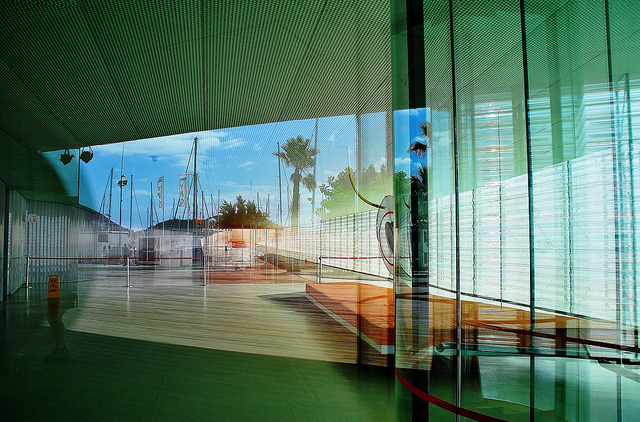 The Batel is the auditorium and convention center of Cartagena, a small city of about 200,000 people on the Mediterranean coast in the Murcia region of Spain. 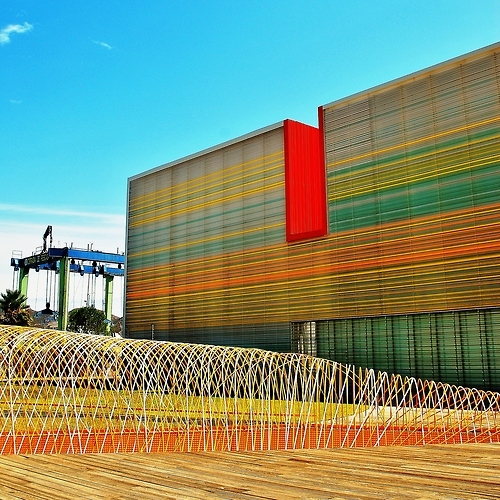 Textural and functional color come together in Cartagena's The Batel. 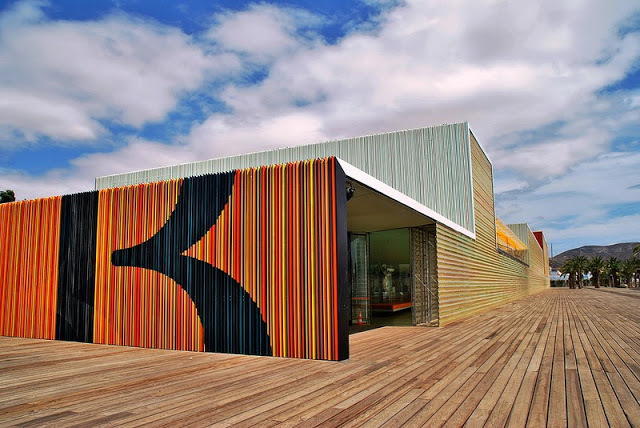 Designed by architects José Selgas and Lucía Cano, the center is a fantastic example of textural color outside and functional color inside. The city of Cartagena is rich with the traditions of sea-based trade, a port town dating back to about 200 BC. 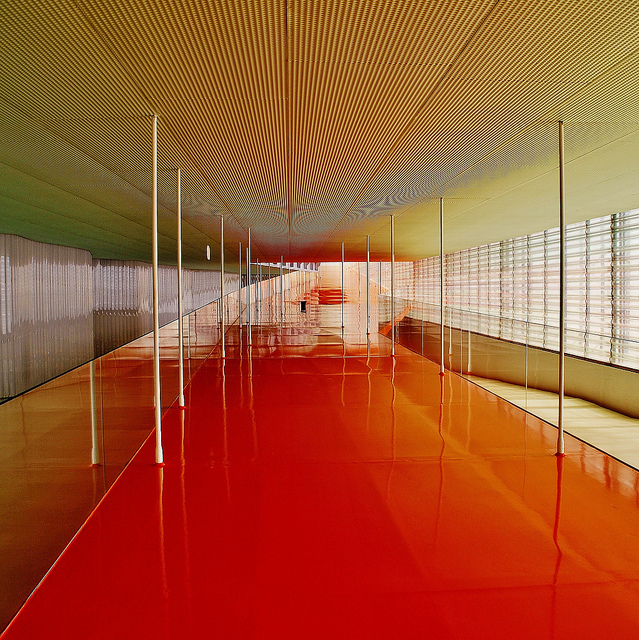 The architects used our spherical coordinate system of longitude to inspire the look and layout of the center and focused on color to bring out the linear threads of the building. Not shy about its industrial neighbors, the center allows its shipping cranes to peek out from behind the building's brightly striped exterior. 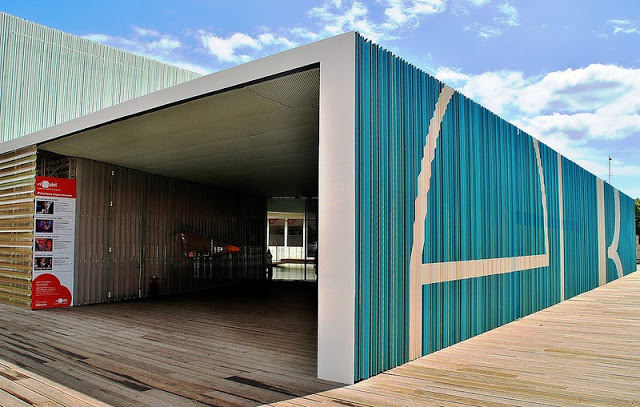 Much of the exterior is covered with striped and slatted multicolor siding, along with two undulating translucent facades made from ETFE (ethylene tetrafluoroethylene, a type of plastic with great resistance to heat, corrosion and UV exposure). Instead of being painted after the fact, the material is dyed during extrusion with neon pigment. But the real eye for color continues to entice once you venture inside. 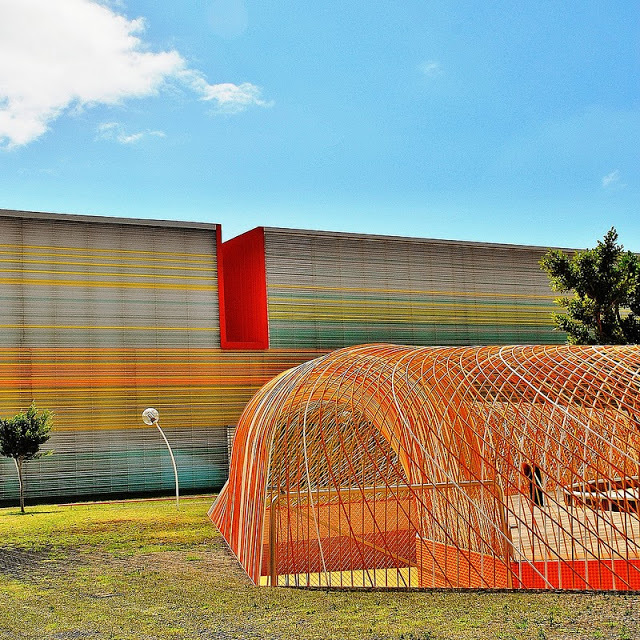 The Batel is interesting not just for its cultural sensitivity to its surroundings, its linear inspiration, and its colorful exterior, but also because the interiors use color in very specific and well-thought-out ways. The architects took into account the myriad ways and kinds of events these convention centers produce, then designed various halls to accommodate the events' desired mood or atmosphere. Having a relaxing but interesting talk on the application of quantum computers? Try Hall A, one of the complex's auditoriums, nestled just below sea level and paneled in deep blue polycarbonate. Used for everything from heated discussions and lectures to music performances and poetry slams, the space feels relaxing and harmonious. But perhaps after the lecture, you need to get your scientists moving, mingling and sharing ideas? Then move over to Hall B, designed with airy ceilings and warm colors that suggest a stimulating experience in an inviting atmosphere. The Batel uses color not only to delineate different spaces, but to activate a similar mindset in a diverse and disparate crowd of people. As always the sign of our times that sells dramatic and decorative color without having an understanding of color ergonomics - meaning the interrelated subjects of color psychology, neuropsychology, visual ergonomics and emotional aspects including physiological reactions to the built environment for the benefit of humans. The red floor in Hall B is extremely disturbing. When will architectural designers, interior designer etc. finally understand and learn what decades of research regarding human reaction to the environment has proven. Research not used is research lost.